They do not fly, they do not sting and they don’t have a queen or a king. They have a history as long as their rugby pedigree can be traced. Lankan rugby arena. They are the Josephian Hornets who are behind the resurgence of rugby down Darley Road. They do not fly, they do not sting and they don’t have a queen or a king. They have a history as long as their rugby pedigree can be traced. They are a band of Old Josephians who have gathered with their stinging passion for rugby and alma mater to support college rugby. Ironically, St Joseph’s College 1st XV rugby is sending ripples in the ongoing Schools Rugby League after they stung Peterites in their first encounter and then almost crippled the much-fancied Isipathana College. I had the privilege of meeting two members of the Hornets who are silently carrying out their duties in the nest, namely former Josephian captain Cuthbert Charles, who also is CEO of Hayleys Energy, and former rugby player Manilka Fernando a Director at Pership Group. “Since they couldn’t play under the college name they called themselves Hornets and started to play some friendly matches against other novice teams and occasionally second string teams of clubs. Cuthbert Charles took us back in time: “It all began in early ’50s, I think in 1953/54 when Mahendra Dias and Lalith De Mel started gathering their friends and those who were interested in playing rugby to come to play rugger after school. Rugger as a sport was picking up and there were few schools (during the post-World War II only Trinity, Royal, St Peter’s were playing competitive rugby and Zahira was yet to commence after the break) and clubs were playing rugby largely dominated by European players. College didn’t have rugger as a game and they (college) were not supportive of this,” he said. Football Union as they were taking interest to promote the game among schools. 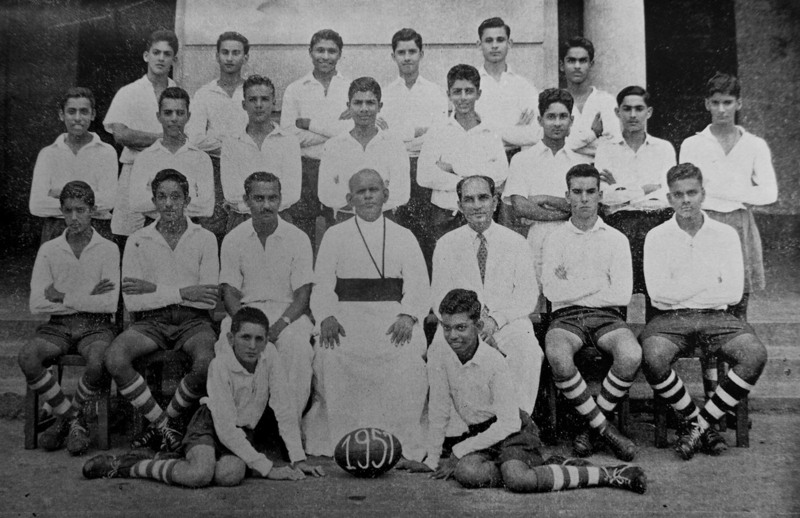 The first St Joseph’s rugby team ran out on to the ground in 1955 under the captaincy of Mahendra Dias, with Percy de Silva as coach. 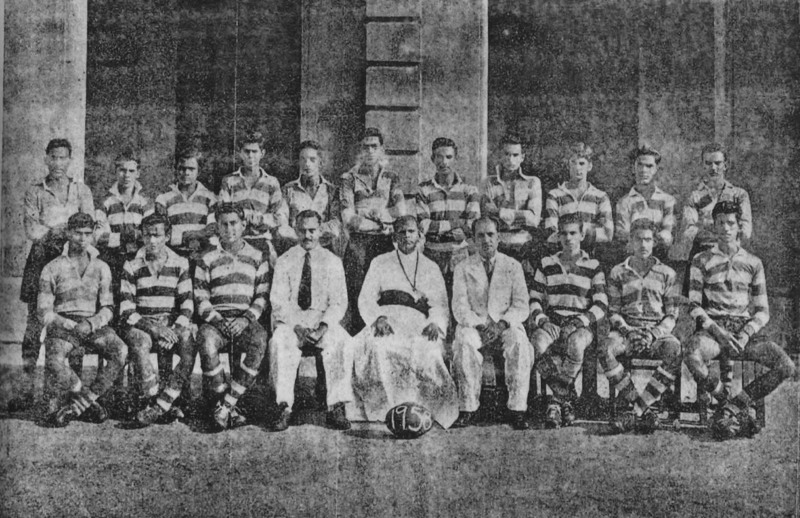 Extracts from the Blue & White Magazine, 1955 “It was decided in September 1954 to introduce rugger (on the invitation of Ceylon Rugby Football Union) into St. Joseph’s and by the beginning of October that year we had a group of about thirty boys training under Mr Evarts of the C.H. and F.C. We were badly handicapped without suitable grounds and had to have our practices on the C.H. and F.C. grounds. Soon Mr. Evarts had to leave us due to pressure of work and our boys were taken over by Mr. Percy de Silva and our practices were held on the C.H. and F.C. grounds. We had regular practices throughout the third term last year and in the first term this year we continued to have practices once a week. Unfortunately, many of the boys who would have secured places in the college team left us at the end of the year and we had to train others to fill their places. official sport at college. But still I never told my parents that I’m going to play rugger or even to see rugger matches, because rugger was not seen as a game for boys or for gentlemen and cricket was the most popular sport. So getting boys to come for practices was a task. “We had students, some were very good friends coming for rugger practices from various other sports too. Some came occasionally. I remember the Manthree brothers from Negombo who were footballers, Sam Lovell who was a wonderful basketball player and also the goalkeeper of the college side, Hiranjan Perera who later played for CR & FC and Sri Lanka also was among those who played along with us. “C.R. 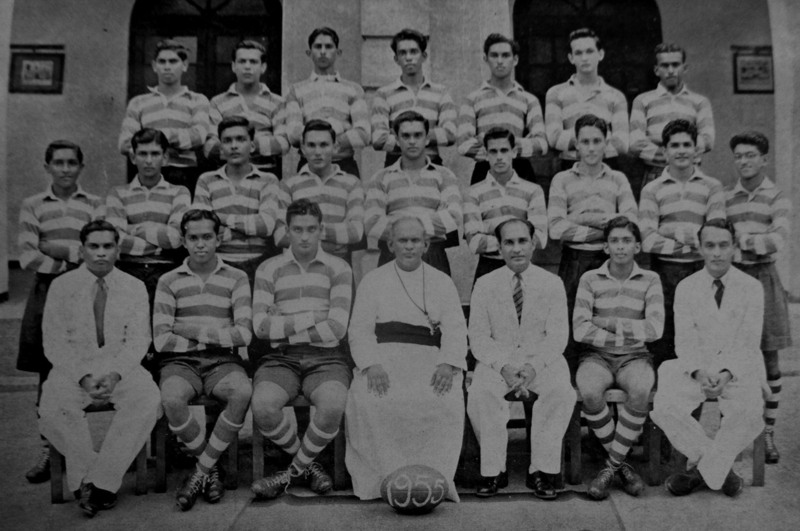 Rajaratnum was the College Captain in 1958 and Cedrick Direcksz was in 1959. I played as a prop forward in 1960 under Brian Paul. I captained college in 1961 and then Hiranjan Perera followed me. was a tough life for us back during those days. This is since we didn’t get much support from college or from home unlike today. No funding, no fancy boots or not even a proper ground to practice. We had to manage everything on our own, we were coached by Nueman. We were taking on some of the bigger boys in schools rugby and those who were strong and skilled. But we had the passion and commitment to play rugger and to do well as Josephians. Trinity, Royal, St Peter’s were well established and then St Thomas’, St Anthony’s Katugastota, and Wesley just entered the game. We also played against Greenlands College, later Isipathana College, but they were not strong as they are now. We enjoyed those games, though most of the time beaten by the fancied teams. “In 1961 I joined Havelocks Sports Club and played till the mid-’60s until I migrated. I remember playing under Dr Hubert Aloysius in ’61 and in ’62 I played under Maurice de Silva and others such as Ken de Joodt, Y. C. Chang, Frank David, Dicky Jayatilleke, Gamma Fernando and Nimal Maralande. When I migrated to England in 1965, I wanted to play some rugger, so I went to this club called Blackheath Wanderers in London. The manager said, ‘You can fit into our 34th team and that too if you have speed to run as a three quarter’. When I said I would like to play as a tight head prop forward, he laughed and said ‘No way, unless you want to die’. So that was my English rugby and the end of my rugby career. “However, I kept in touch with college and the teammates, some of them were from the original Hornets. I was one-time president of the Old Boys Branch in UK and while I was travelling around the world had the privilege of meeting many Josephians in Europe, Australia, USA and Canada etc. So we supported college rugby as much as we could and when I returned to Sri Lanka to settle down few years ago the work got intense as we revamped Josephian rugby and Hornets. “I took over the presidency of Hornets (now functioning as Official Rugby Supporters Club of St. Joseph’s College) this year from Lalith De Mel, our very first president and the initiator of Hornets, who served between 2010 and 2013. 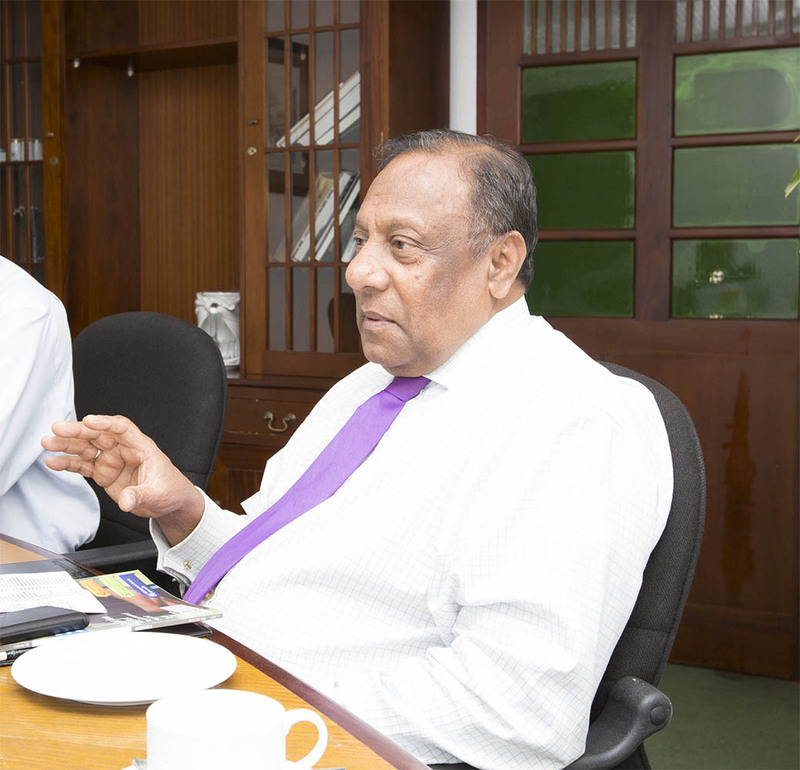 We are now fully backing the college rugby and administrators to ensure we consistently perform and maintain standards.” Talking about the formation of the Hornets into a rugby support mechanism, Manilka Fernando, who played in 1971 and 1972 for St Joseph’s College 1st XV and was involved with Josephian rugby since then, joined in the discussion. He is serving as a board member of Hornets. Manilka recounted: “I played under Vasantha Abeyratne in ’71 and Nissanka Weerasinghe in ’72. 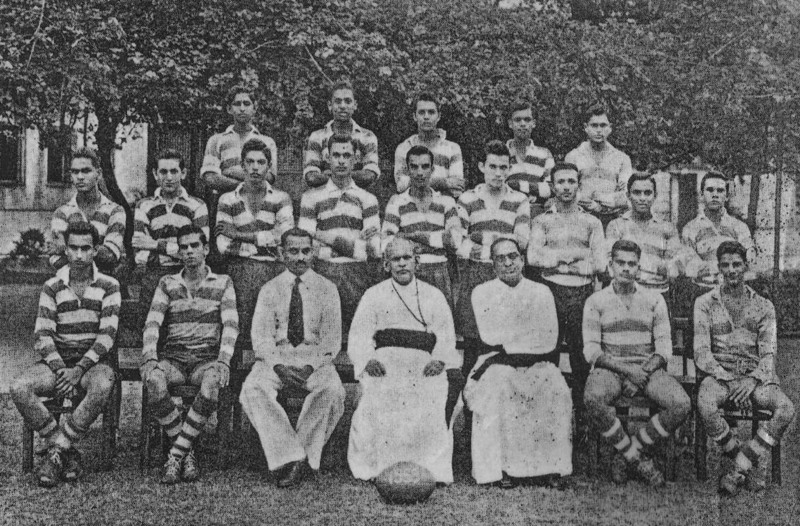 Some of the outstanding players who played club Rugby were Russel Baptist, Andrew Van Hoff and Ajit Johnpillai. Others who come to my mind are Herbert Alagaratnam from the Alagaratnam family of St Peter’s, who joined us, and Priyasath Dep who is now a Supreme Court Judge. “We had two good teams but it was the case of near misses where we sometimes dominated but failed to win. I remember some memorable games against Trinity, Royal and St Peter’s College. We had Mohan Sahayam (Trinitian) and Anton Benedict (Josephian) as our coaches”. The Josephians lost close games against St Peter’s in both these years. The Peterites under Jizvi Nizar in 1971 earlier beat Royal and drew with Trinity and in 1972 it was the champion side under Jeffrey de Jong. “If you run through the Josephian rugby history you can see it was a case of inconsistency. We had a good formative period in the 1950s and we progressed well in the late ’60s before losing our way in 1970. We regrouped again in the early ’70s but the game was briefly not played at college between 1975 and 1977. At this stage, Lalith de Mel, who initiated the Hornets, returned to set up junior rugby and senior rugby where we went through a rebuilding phase before reaching a pinnacle by ’86 and ’87 and then again we nosedived in 1990. “I got involved with a few other colleagues and we again regrouped. In 1991 we beat Royal for the very first time but by the mid 90s we lost our way. Again, I was involved with Kenneth De Zilwa and Sunimal Dias back in early 2000’s as we started to rebuild Josephian rugby”. During this period, the Joes often gained promotion to A Group (Division 1) but couldn’t sustain their stay for long and soon found themselves back in the B Group. Manilka shares his insights on this: “In the recent past it has always been a couple of really good seasons, especially when we were in B Group and got promoted to A Group and then we fared poorly to be demoted again. We have failed to maintain good sides over a period of time and every time we had an outstanding team it was followed by a mediocre side. • Rugby Culture – most of the students come from the north of Colombo (and beyond) where they are not exposed to or are following rugby as much as those who are coming from central or south of Colombo. However, these young Josephians are keen on other sports such as cricket, swimming and football (traditionally). • Succession of players – not having a feeder system, proper junior rugby and making use of champion teams. • Fitness of players – not placing greater emphasis on training, conditioning, nourishment of players. • Practice venue – not having a proper venue for rugby practices. • Expertise – not having the best coaching staff across all age groups. • Finances/Funding – not generating sufficient investments or having a sustainable funding mechanism. Hornets as a Josephian Rugby Supporters Club in 2010. “Yet again, Lalith De Mel came to the rescue along with some of the other seniors like Brian Obeyesekere, Sumith Adihetty and Manik Pereira. This is open for all those who support rugby rather than limiting it to former players as we need as much support as possible. We delegate and share the workload. We have set a target that we (1st XV) should never get back to Division 2 or get relegated. We are happy to say, for five years in a row we are competing in the A Group, whereas in the past the most we would have been in A Group is two years. “It is perceived that support comes most when a team is winning but to bring about a winning team one needs to gather support”. “We now have a stronger coaching staff, stronger bench, sponsors, sound junior rugby academy and most of all a following for Joes rugby at college and within the Old Boys. It got better from the first game this year as we managed to break the 15-year hoodoo and win against St Peter’s to take the Fr Basil Wiratunga Shield. “However, the challenge is to sustain this and it is not easy. We have a long way to go in realising our dreams for Joes rugby, including acquiring a rugby ground. We are confident and really positive of the future of Joes rugby.” They are united and focused and unlike in the past, they want to be consistent. With such a stinging force if Hornets can go about their work, defend their hive and nurture their young, fields of glory await them. Names Of Team Members Appearing In 1958 Pic. Standing L-R. Cuthbert Charles, Wilhelm de Zylwa, Annesley de Silva, Adrian Assauw, Tissa Seneviratne, Hugh Rozairo, Not Known, Tony Phoebus, Nimal Abeyratne, Jinna Jinadasa, Vivian Direcksz. Names Of Team Members Appearing In 1959 Pic. Standing Back Row. L-R. Chula Delgoda, Cuthbert Charles, Adrian Ferreira, Colman Ebert, Annesley de Silva. Francis Raymond, Pararajsingham, Wilhelm de Zylwa. Seated. L-R. Tony Phoebus, Cedric Direcksz, H. Numan, Fr. 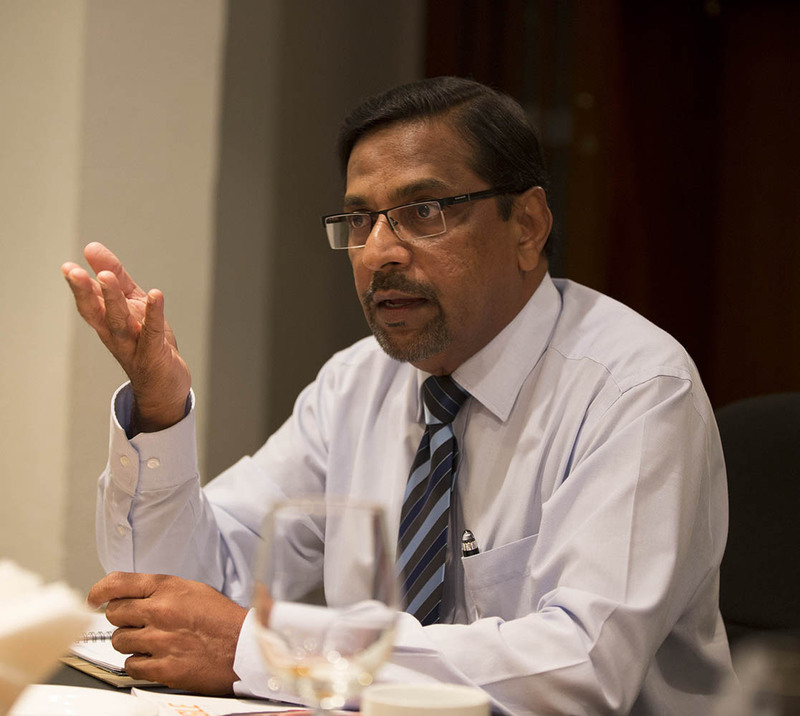 Peter Pillai, Fr. 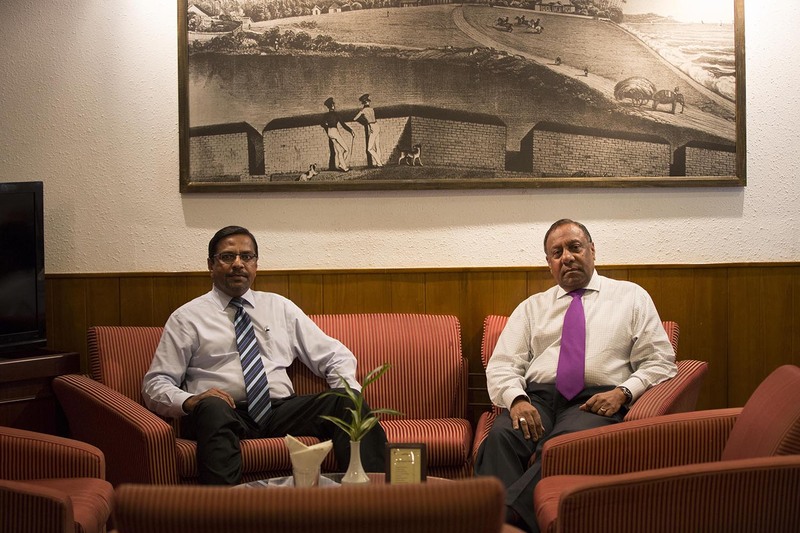 Gerry Abeysekera, Brian Pau, Nihal Abeyratne.